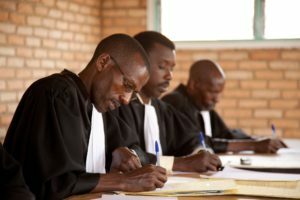 TRIAL International brings justice to victims using mainly two different fields of the law, either jointly or independently: Criminal law and human rights law. In both cases, individual victims have suffered serious abuse, and the crimes are of similar nature. But while human rights law addresses the State’s responsibility, criminal law deals with individual deeds. Criminal law applies when an individual – or corporation – is accused of having committed a crime. This person may be anyone, an anonymous person or a head of State. He is presumed innocent until a verdict proves otherwise and is entitled to all the guarantees of a fair trial – right to a lawyer, to follow the proceedings in the language of his/her choice, etc. Criminal proceedings usually take place at the domestic level, with national courts assessing the guilt or innocence of the accused. Depending on the cases, the case may be tried in the country of nationality of the accused or the victims or the country where the crime was committed. In some cases, it can even be in a third country, thanks to the principle of universal jurisdiction. In exceptional cases, international criminal tribunals or the International Criminal Court may prosecute the accused. Most cases litigated by TRIAL start at the domestic level, using the country’s array of criminal laws. Then, if justice is not satisfied, TRIAL takes the cases at the international level, aiming at proving that the State has been unwilling or unable to address the crime and provide victims with truth and reparation.